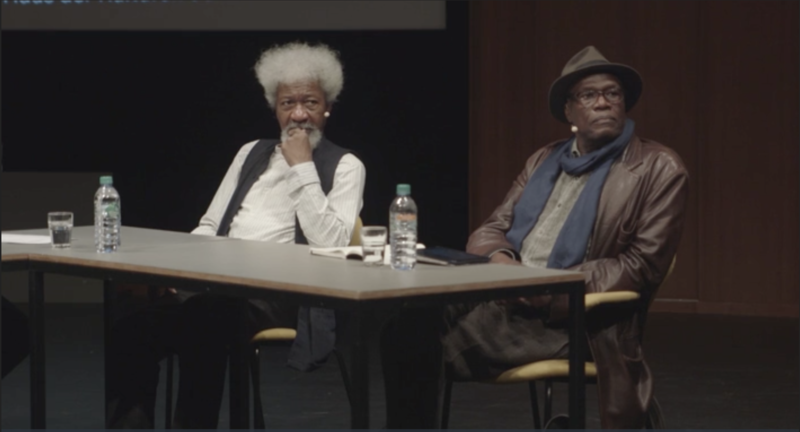 This Wednesday, the HKW screened the film premiere of Manthia Diawara’s new documentary „Négritude – A Dialogue between Soyinka and Senghor“. Diawara’s documentary, which he calls an „archival construction“, mixes found footage SHOT in THE former french colonies during the 50s and 60s with interviews of Wole Soyinka and Léopold Senghor. The movie aims at figuring out what the lasting relevance of négritude today might be. 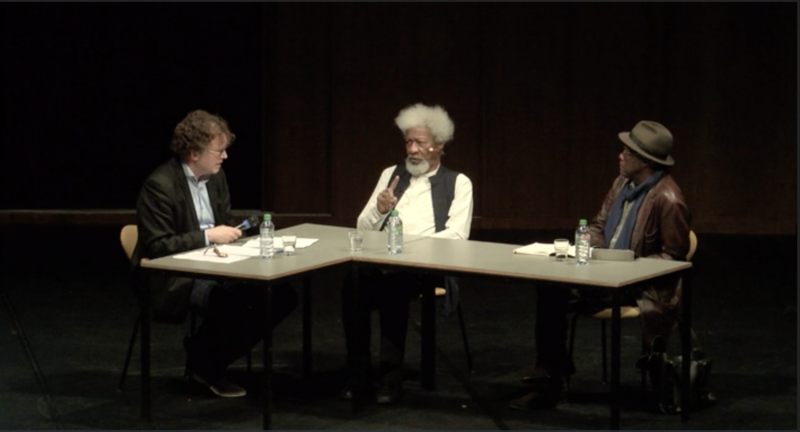 Diawara and Nobel laureate Wole Soyinka were live on stage afterwards to discuss the role of truth in the Négritude-movement and Glissant’s so-called „Poetics of Relation“. Jointly, they wanted to examine methods of truth production. In Diawara’s film, Négritude is defined as „the way of being black in the world“. The term was coined in the 1930s by Léopold Sédar Senghor, the first president of Senegal, and Aimé Césare, a poet from Martinique. The term describes a socio-cultural consciousness of the value and uniqueness of African culture and identity. It was a counter-concept to „francité“, the imposed cultural values of the French colonialists, and a movement to fend off the devaluation, exotification and assimilation of Africans by White colonialists. During colonialism, the movie goes on, the British Empire made no effort to assimilate the people in their colonies, whilst the French aimed at cultural assimilation of the colonies to the French way of life. The terms „Greek culture“ and „African culture“ describe very different point of views for Black people and point to the ambivalent identity that people from the colonies were forced to position: their original uniqueness versus European standards. Africans were struggling against appropriation and essentialization but for uniqueness. The Négritude movement lead to a celebration of African habits, spitirtuality and folkore based on intuition and rhythm. Before the arrival of Europeans and their Christian missionaries, we further learn in the film, the African peoples adhered to non-violent religions, which have survived despite conversion by Islam and Christianity. There were and are own African metaphysics, according to which the animus also lives in inanimate objects and is the spirit which leads to ultimate, perfect knowledge. Existence is a quest and consistent search, there is no revealed one truth – that is the meaning of life. It is a philosophy in stark contrast to the Western scientific and Godless world, which is seen as a source for many of the social inequalities and that Africa did not want to repeat. Upon decolonisation, the new countries had to fight against self-exploitation and selling out to the modern national state system. So far the red thread of Diawara’s archival construction. The movie questions the logic of national boundaries and nation states: „Is human nature static? Is a social system static? Even culture is dynamic.“ So, how can Africa be presented not as a museum, but as a contemporary but different way of life. Europeans think, the movie concludes, it is them against the third world, but the cultures of the world are not defined by European positions. The task of the time is to think universal, because multiculturalism is irreversible. The arrogance and imperialism of the West are only a passing phase with no future. Bernd Scherer, Wole Soyinka, Manthia Diawara in discussion. Video still. Following the movie screening, Bernd Scherer, the head of HKW, facilitated a discussion between Soyinka and Diawara. Unfortunately, the level rapidly fell from that moment onwards. Scherer posed questions that were self-explanatory, Soyinka obviously enjoyed hearing himself talk and Diawara kept silent or repeated what the movie had already made clear. It was no surprise, therefore, that many visitors left the hall prematurely during the discussion. Soyinka starts outlining that there are three generations of négritude: Léopold Senghor and Frantz Fanon in the first; Édouard Glissant and Wole Soyinka in the second; and Manthia Diawara – who belongs to a generation that has replaced the term Négritude with the concept of Créolité. This is because Négritude has been criticised for its essentialist and exclusive notions about what it means to be Black/African. 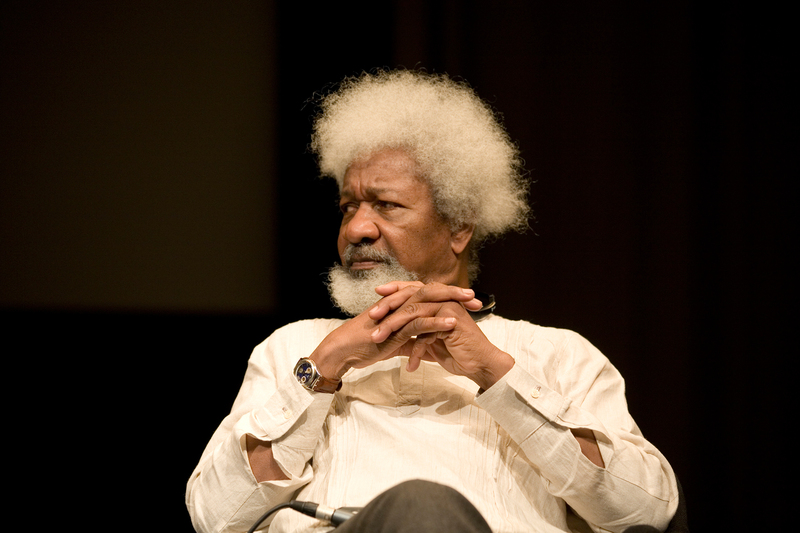 Soyinka is against any essentialist notion of Négritude and romanticizing of the past. First the movement was exclusive, he explains, because Africans had to rebuild their value against that which oppresses them. Then, he continues, it aimed at constructing a universalist culture in relation to others. This is captured in the concept of ubuntu by Desmond Tutu, which means „humanity“, „brotherly love“. Soyinka then told a variety of anectodes to illustrate how truth systems are constructed: when he was diagnosed with malaria on a Berlin trip, for example, doctors were alarmed and wanted to send him to treatment in Germany, whereas he felt that this was an unserious condition and that doctors in Nigeria were more familiar with treating it since they had been dealing with it for generations. Thus, he concludes, the health system is a truth system in which sciene and institutions produce what malaria is as opposed to real-life experience and knowledge passed-on. How this story contradicts that hundreds of thousands of people (in Africa) die from Malaria each year due to lack of adequate treatment remains his personal answer. In another story, Soyinka describes how European psychotherapists tried to heal child soldiers after the genocide in Rwanda. After weeks of sitting down with the children one-on-one in isolated rooms and talking with them about their experiences, no progress in their mental state was made. When the locals then stepped in with traditional healing, most children regained their happiness and will to live. How come? How should sitting down alone in a dark room and having to talk about your violent and cruel memories make you feel better?, Soyinka asks. The locals send the children to play, dance, make music and celebrate and thus gave them back their stolen childhood. What a pity – there are so many questions in relation to today’s issues around identity politics and cultural relativism. This discussion could have contributed some great ideas and insights to a public debate – had there just been a discussion.